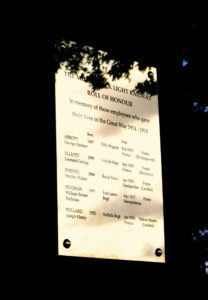 On Monday 27th August The Middy held a service of remembrance to dedicate the new memorial to MSLR staff who were killed on active service in the First World War. When the war broke out in 1914 there were some 60 staff working on the Middy. Of those who answered the call to the colours five never returned. In this year of the 100th anniversary of that terrible conflict The Mid Suffolk Light Railway have raised a memorial to commemorate those staff members. The Memorial will also serve to commemorate Volunteers of the revived railway who have passed on. The service was conducted by the Vicar of Wetheringsett, the Reverent Julia Lall. Proceedings were introduced to railway visitors and Wetheringsett villagers by the Middy Vice Chairman, Ian Meigh. The memorial is sited with easy access just along from The MSLR Restoration Shed at Brockford Station.